A very recent rediscovery of this rare species, which seems to have disappeared many years ago. 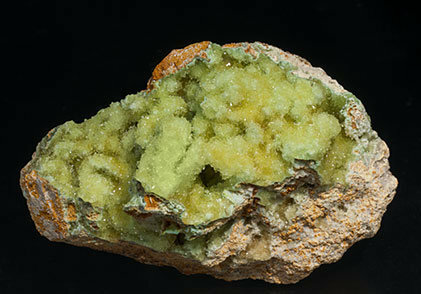 On fissures and vugs of a Limonite matrix grown small yellowish crystals of this rare phosphate on a base of blue Turquoise. 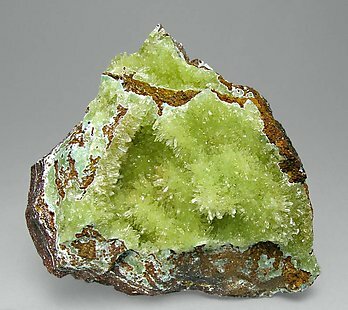 This specimen was published on the Mineralogical Record´s web page, in the ‘What's New’ section of the March 13, 2008 edition. 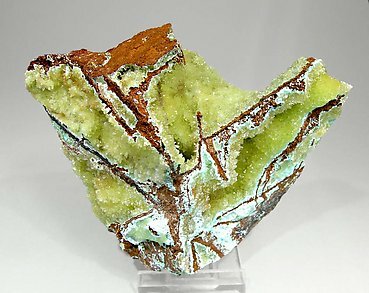 Really esthetic specimen formed by vugs coated by very sharp and lustrous Senegalite crystals, with an intense yellowish color and transparency. Between the matrix and the Senegalite crystal base, one can see a thin blue layer of Turquoise that is coating other small vugs in the matrix. The specimen is from a recent find (March 2008) at the Type Locality for the species. Very rich Senegalite vug coated by very sharp and lustrous crystals with an intense yellow color and high transparency. 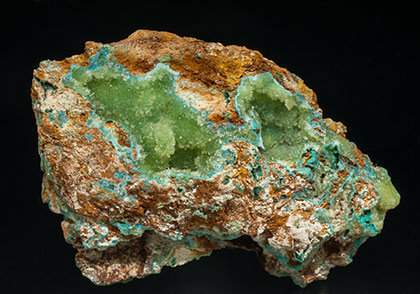 Between the matrix and the Senegalite, one can see a thin blue layer of Turquoise that is coating other small vugs in the matrix, accompanied by white Crandallite. The sample, from the type locality for the species, is from a very well known and find in 2008. Very rich Senegalite vug with spheroidal growths of very sharp and lustrous crystals with an intense yellowish green color and high transparency. Between the matrix and the Senegalite, one can see a thin blue layer of Turquoise that is coating other small vugs in the matrix, accompanied by white Crandallite. The sample, from the type locality for the species, is from a very well known and single find in 2008. Very rich Senegalite vug coated by very sharp and lustrous crystals, with an intense yellow color and transparency. 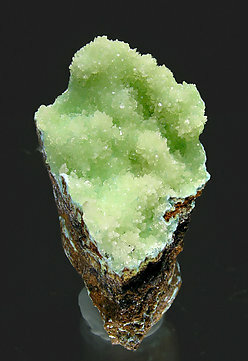 Between the matrix and the Senegalite crystal base, one can see a thin blue layer of Turquoise that is coating other small vugs in the matrix, accompanied by Crandallite. It is from a recent find (March 2008) at the Type Locality for the species.